March was an exceptionally busy month for The Oxford Blue. Steven and Ami met with local and regional food suppliers to discuss new seasonal produce availability whilst the front of house team prepared to learn all about new dishes and pamper guests dining on Mother’s Day. We thoroughly enjoyed welcoming everyone here for a celebratory meal. It was such a pleasure to provide all our guests with a special dining experience. Seasonally inspired dishes launched our exciting new menu. 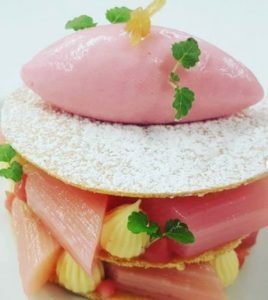 New additions included a superb sharing main for two – Cote de Boeuf – and Ami’s beautifully crafted desserts like Rhubarb Mille Feuille. 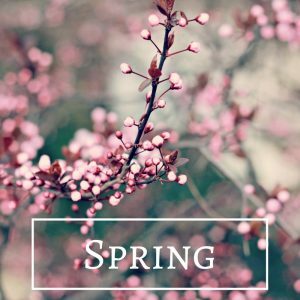 After a season full of rain, wind and very little sunshine, it was great to get Winter out of the way and March into Spring. Let’s hope that temperatures start to warm up soon so the outdoor Terrace can be used by guests. 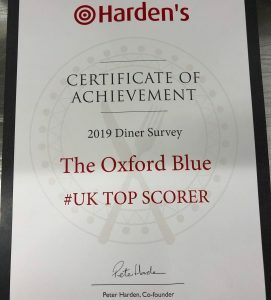 The team were delighted to receive a surprise in the post from Harden’s diner’s for being a UK Top Scorer. Harden’s collect thousands of customer reviews to rate restaurants for their Food, Service and Ambience, and it was fantastic to be unexpectedly awarded a certificate from them.